I was thinking of sticking around Monday since WordPress always seems to be busy after the weekend. Then I saw the weather and realized tomorrow is the perfect day to head for the big zoo. Their Children’s Zoo area opened a little over a month ago and it’s been a while since we did a father/son outing that wasn’t for shopping. So I guess I’ll do the morning stuff and then return in the evening. This may also give me some time to figure out what to do about hype for Merchant of Nevra Coil. I want to prepare some posts for it, but I’m not sure when to schedule them. It isn’t confirmed that I’ll release on August 1st, so setting everything up for the last week in July might be an issue. Though I could make it and switch it if things need to be changed. That’s really it. I’ll see what else comes up or work off suggestions. Anyway, I’ll be busy tomorrow. Maybe tonight since it sounds like the little guy is giving people trouble. Best not to be rushed at the zoo. I hate running out of time there. Me too. So far we’ve hit most of it during every trip. There are a few spots that the kid has no patience for and one place has an insanely long line. The zoo sounds like fun! I want a trip to the zoo! As far as posts, those sound interesting and can’t wait to read them! You always have such interesting posts! Thanks. Hoping to work on them this week, but they won’t be live until last week of July the earliest. Gives me time to figure them out at least. Yeah I just recently started that whole writing ahead thing! Talk about much easier to manage! The only downside is too far ahead and you forget what is going up on the blog. Smart move. I started at a week, but then I kept getting ideas and scheduling them. Now it’s around 3-4 weeks, which seems to give me a lot less to worry about in terms of blogging. Though that’s just me. I’m not the sanest person out there. *grins* as writers are any of us really “sane”? it is a good thing I am not a cat! That is for sure! The picture is actually from a small one that a nearby nursery set up around Halloween. Not sure if we’ll do the petting zoo part. Sounds like a fun day. You deserve to have a little fun. Thanks. Should be a blast. Good weather means a lot of animal activity too. I’m always in favor of a day at the zoo! Those are special memories that you’ll have forever. As for your writing plan, I would love a Post about Nevra Coil and how tech works in Windemere. Awesome pics! Looks like the kids had a fun time! He had a blast. Got to see some new animals this time. How the kid still has energy is beyond me. 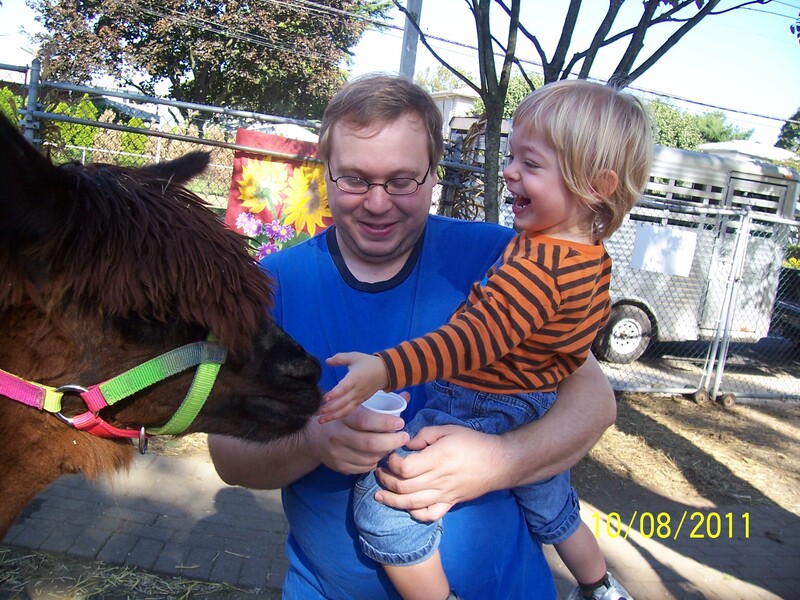 That’s actually an older picture from a petting zoo that was across the street for a bit. My dad hasn’t sent me any of the zoo pics from this week. Though I have some from the second zoo trip we did to a smaller one yesterday. Might use one of those for the next post. Hope you’re having a great time at the zoo. Maybe it will inspire you to come up with new animal hybrids in your world. Though you already have that covered very well. It was fun and exhausting. Nothing really writing-based came up in my mind. The animal hybrids tend to be second nature since I spent most of my youth at the zoos. The Children’s Zoo is just part of the big zoo. Though we might be going to the smaller zoo tomorrow. Last day of good weather before the storms and long trip. And I’m a big fan of a bit of silliness among the heaviness. Me too. Though I know some people who refuse to indulge in silly. Such a shame. This comedy is going on at the beach? Intriguing. No, that’s where we go to escape the comedy that takes place in our Parliament! Wait. Politicians are more comedic than useful? Guess that’s a global problem. Sadly it tends to be lethal for other people. True. You don’t see many effective and honest politicians in fiction. Would it be the ‘Bat Fax’? Holy macaroons, Charles! You’ve seen it, then! I tried, but we lost the connection. I’ve got Alfred on the roof with the cables. Not that I know if that has anything to do with this, but he really wanted to be useful. Could you please send him my way, when he’s done? It’s almost tea time over here. Sure. Think I’ll get human Jarvis to help anyway. Is he still human in the comics? No idea. We should ask Tony. Or Pepper. I get the feeling he’d ask her anyway. Except the storm isn’t happening, so I don’t have any more outside plans. The kid doesn’t accept that high heat and humidity is a good reason to stay inside. I sometimes forget about those conditions that make summer unbearable. Staying inside is a good decision then.